Freebird's flights of fancy: The end of the world is nigh! Well, maybe. But then again it was supposed to have ended last year (twice), and in 2010, 2007, 2003 (twice again) and so on. 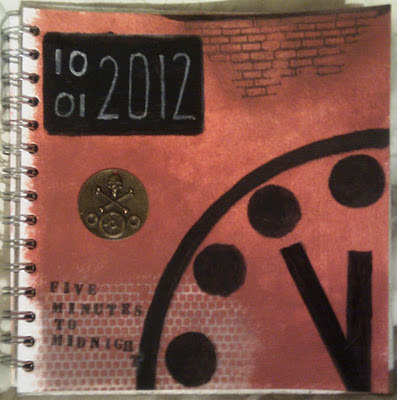 Anyway, on Tuesday the "Bulletin of the Atomic Scientists" advised that the Doomsday clock has moved forward by one minute. There's no need to start building your own nuclear bunker just yet though. The clock has been moving forward & back since 1947 and it's been a lot closer before now. Love how you did the clock with such bold lines & circles! The textures add a great touch! Yeah, the end of the world. I always thought it would be great if the media found those same kooks who were on TV, warning everyone about the "end being near" & ask them, after the fact, WHAT HAPPENED? Course, you just know they'd justify it somehow. Easier just to not pay attention to them in the first place. Great seeing your work again Nigel.